Are there surgical instrument kits available for general patient care? 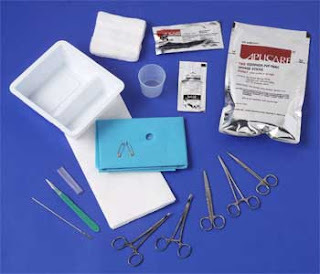 Although most surgical kits are designed specifically for surgical procedures or speci fic types of treatment options there are also generalized types of kits perfect for any doctor, clinic or treatment facility. E.R suture kits are one general type of kit that is always handy to have for minor suturing and wound care. Additionally a minor surgical kit that has all the forceps, retractors, needle holders, scissors and clamps necessary for basic surgical procedures are also ideal for general practice doctors. Another kit that is always going to be used is a wet skin scrub E kit. This kit is perfect for surgical preparation or dealing with minor injuries right in the office. The kit contains sponges, which are disposable, sponge sticks, towels and applicators for applying the PVP scrub and paint to the area required. In addition these kits contain a pair of nitrile gloves and CSR wrap for keeping the area clean after sterilization. The kit comes in a handy double tray with four compartments, keeping all components of the kit in place even when moved or in transit. What options are available in ear, nose and throat (ENT) surgical instrument kits? Ear, nose and throat procedures use a lot of specialized medical instruments, so having kits available that contain just what you need is a time saving option. This is particularly true if ENT is not the only type of surgical procedure you may have to perform. Kits can include the instruments necessary for basic or major types of surgical procedures, allowing you to determine what type and design of kit is best suited to your needs. Basic ear surgical instrument kits will include all basic medical instruments such as retractors, scissors, skin hooks, suction tubes, forceps and needle holders, but also a variety of sizes of specialized ear specula. Likewise nasal sets include specialized Maltz rasps for backward cutting as well as nasal dressing forceps and tonsil hemostats. Tonsillectomy and adenoidectomy sets also provide specialized instruments such as adenoid curettes, tonsil knives and tonsil punches. What types of surgical instrument kits are available for specialized types of practices? As indicated there are several different surgical instrument kits specifically designed for distinct medical procedu res. Kits are available for labor and delivery, gynecological and obstetrical procedures, ENT, ophthalmology, orthopedics, rectal surgery, abdominal procedures as well as laparoscopy and plastic surgery. The plastic surgery kits contain a wide range of both general and specific instruments in various sizes, perfect for both minor and major cosmetic surgical procedures. Each of these kits has the basic or advanced types of instruments need to provide specialized patient care. 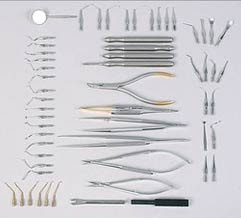 It is important to review what instruments come in each type of kit to determine if you require the basic or major kit. Having these kits available makes preparation for surgical procedures much easier as you always have the instruments you need. The surgical instrument kits do not contain disposable items, they include only the instruments required for the given procedure or area of focus.